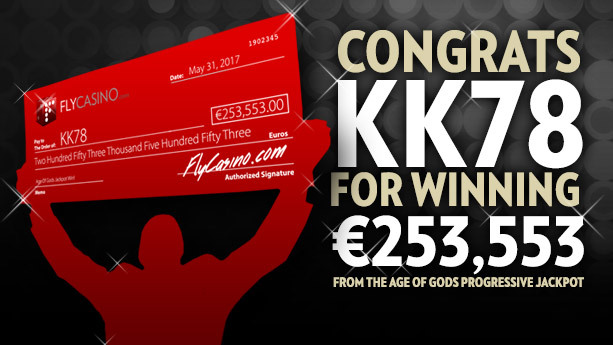 We are thrilled to announce that a very lucky Fly Casino player has won the Age of the Gods Progressive Jackpot for €253,553.00! Our newest jackpot winner KK78 has been a member of Fly Casino since May 28, 2017. During his first few days with Fly, his luck was running up and down. Then, late into the evening on May 31st, he decided to deposit $10 and started to play King of Olympus. Two hours later, he won over a quarter of a million when he was awarded the Ultimate Power jackpot! The Age of the Gods four Progressive Jackpots can be won randomly after any spin on any of the Age of the Gods themed games. Congratulations to our jackpot winner! Super 110% Bonus. From 00:00GMT until 23:59 GMT, all members on their deposit of just $/£/€10 or more will receive a 120% bonus up to 120.00. 166% Big Money Tuesday! From 00:00GMT until 23:59 GMT, all members are invited to receive a 166% bonus up to $/£/€266.00 on your deposit of just $/£/€10 or more or more.